I had to forgive myself this past weekend for not finishing a Henry James novel. Earlier this year I’d read maybe a dozen of his shorter fictions, all of them with relish. The Middle Years, The Pupil, The Liar, The Real Thing, and The Altar of the Dead were personal favorites. Time again, I thought, to try one of his later “masterpieces.” Having failed before with The Ambassadors, I turned instead to The Wings of the Dove. I was defeated, however, after only two hundred pages. The psychological minutiae and circumlocutions of James’s portraiture, which I could bear lightly enough in short form, began to feel like one of those leaden bibs donned for x-rays at the dentist’s office. Life, I decided, was simply too short to voluntarily endure suffocation like this for another four hundred pages. It’s not entirely up to me, of course, but I do hope to continue as a viable organism for a long time yet. Unfortunately, my doctor tells me that my cholesterol is a bit of a problem. Not that it’s so very high, but it’s a little high for a regular Joe, and higher still for a forty-year-old man like myself whose father had a heart attack at age forty-nine. My grandfather too had his first heart attack about fifty, and his father – an Iowa farmer – died of cardiac arrest in the fields near the same age. Accompanied by no extravagant risk factors which might explain it or give prevention an easy target, heart disease with us is a family tradition. With regard to this particular tradition, however, I aim for apostasy. To that end, my new doctor, a talkative British Indian man my own age, would like to see me on statins. The wife and I have opted first to see what could be done by an aggressive change of diet. As such, though I’m still allowed minor indulgences (a glass of wine, a small square of dark chocolate), the foods I generally prefer to eat are now out of the question. Goodbye therefore to beef. Goodbye to sausage and bacon and cooking with lots of butter. There will be no more French bread and cheese just for the hell of it. I’m learning to feel a little hungry all the time and not to expect much of lunch or dinner. You grow older and you notice that people tend rather easily to die. Not that death itself is easy, but the routes by which one may arrive at it are surprisingly numerous and convenient. The expressway to the grave is always near at hand. I assume that I will die one day of heart disease, but I might just as easily die of cancer, or an automobile accident, or by fire, or by drowning at sea, or by being crushed in a subterranean parking garage during an earthquake. It must be especially horrible to know that you are right now suffering from a disease that will, in all likelihood, put you into the flowerbed before long. Persons I know and care about are facing that prospect as I write. But living itself is a terminal condition and no one is finally spared the hard prognosis. In the cosmic scheme all human lives are brief. Some are only slightly briefer than others. One thing I have so far avoided in my grudging play for healthfulness is initiation into the modern cult of exercise. Walking or bicycle riding for pleasure I will gladly engage in, but programmatic exercise regimens of the sort that my neighbors and coworkers apparently enjoy seem to me more than a little absurd. What would our forebears three or four generations ago have made this habit of unnecessary exertion, of middle-age denialists signing up in droves for spinning classes, or CrossFit, or (God forbid) parkour? Though rooted, it seems, in the denial of decay and mortality, there’s nonetheless an element of the hypocritically ascetic in it. If our employment is no longer honest enough that we break a sweat in earning our bread (only white-collar workers exercise), then we will force the sweat of virtue from our pores as an act of penance. Immediately afterwards, of course, we trumpet our accomplishments through social media. On setting aside The Wings of the Dove I began thumbing again through a small volume of Robert Louis Stevenson’s non-fiction. After the rather tedious company that I’m afraid James had become, RLS was all charm and good humor. In his essay on Thoreau, Stevenson warns against the delicate, fearful, self-obsessed pursuit of healthfulness. “True health,” he says, “is to be able to do without it.” He knew personally of what he spoke, but one shouldn’t press the aphorism too far. Eventually we all, in fact, do without it, but this state in its final form is known as death and not health. Nonetheless, to learn to accept with a good grace the inevitability of one’s own decrepitude, with the restrictions on liberty and pleasure which it necessarily imposes – well, that seems a health goal worthy of pursuit. The cheerful obverse to all these lacunae is that they save us…from drowning in the indiscriminate flood of total recall. Forgetting most of what I do and say makes it easier to accept the fact that I’m required to spend so much time in my own company. I can hardly tell you what I did yesterday, though a galaxy of non-biographical trivia revolves around the central vacuum of memory. These gaps in recall feel vaguely incriminating. Where was I on the night of November 19? You may as well slap me in cuffs, officer. Invasion by Russia used to be an experience in sartorial aesthetics. 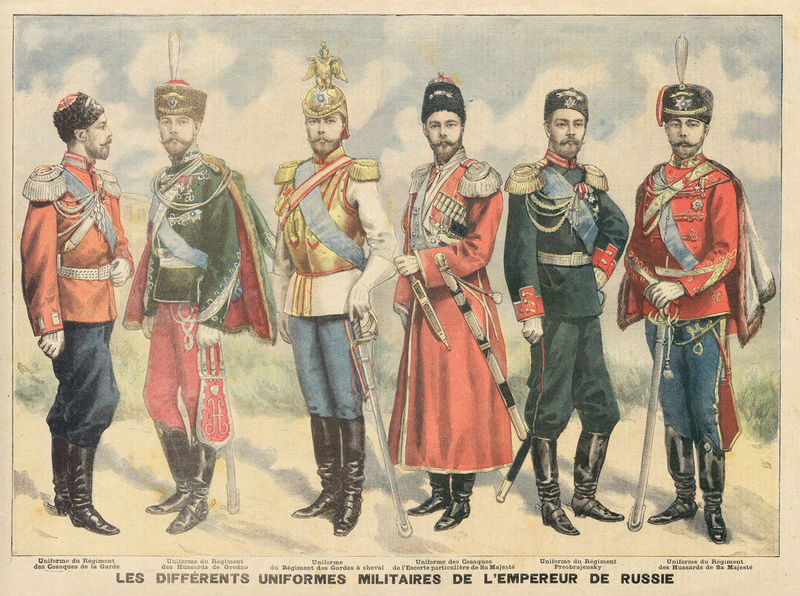 Military uniforms of the Russian emperor, from Le Petite Journal (1890s). What do SpongeBob, Socrates, and space aliens have in common? I have a post up at The Dabbler today which examines this very serious question. I gazed at her with the reverence of an ornithologist at the glimpse of an Auckland Island merganser. In the nineteenth century, when Europeans and other mammals tried to settle the Auckland Islands, the local mergansers showed the world that they would not give up their roosting grounds without a fight. Rather than fly off when threatened, as any bird might do who was used to the predatory habits of mammals, they scurried along and made a stand at the nearest pile of rocks. History teaches us that valiant actors of this sort are generally honored, as the Auckland Island merganser was, by the tribute of total extinction.